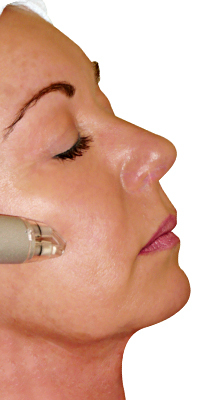 A medical strength rejuvenation treatment, no down-time; skin may show some redness which will soon clear. By gently removing the outer layer of the skin, the body is encouraged to replace the aged skin with new, healthy cells that look and feel smoother, as fine lines, blemishes and scarring all appear reduced. This advanced skin abrasion increases the natural production of Collagen and Elastin in the skin, providing a firmer, fresher appearance. 30 minutes £30, 60 minutes £60 (a more in-depth treatment including a bio-active ampoule and a powerful anti-oxidant, nourishing mask. Highly recommended, good as a maintenance treatment).